I, on behalf of the consumers of Australia, humbly seek your help. I ask only that you put aside your minimal differences so that we may all collude to solve our nation’s greatest retail issue. Easter falls so soon after Christmas that just as the mince pies and crackers leave the shelves, easter eggs and hot cross buns arrive to fill the void. 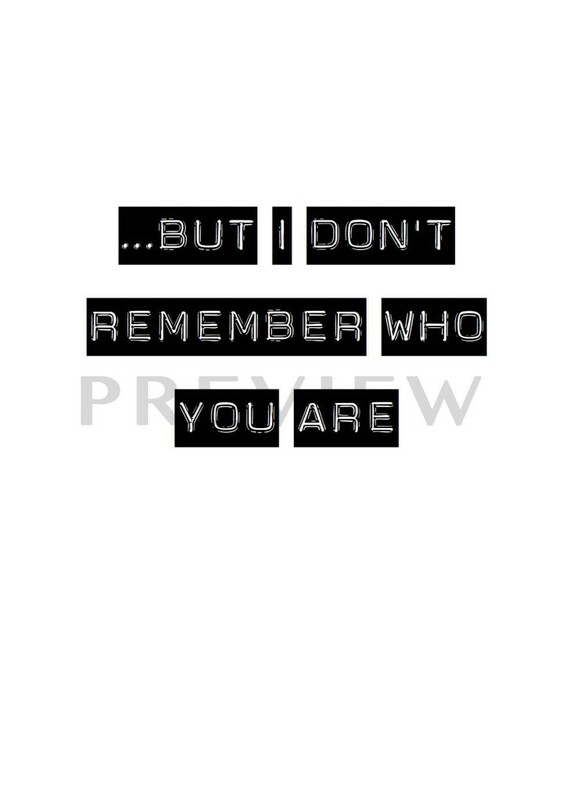 This is to everyone’s satisfaction. But once Easter passes, what seasonal foodstuffs are we to purchase months ahead of the actual occasion? To whom are we required to make half-wanted gifts? Apart from one week of relief where we are compelled to buy cards for our mothers, we find ourselves in a months-long ‘Dead Zone’. Consumers yearn for obligations and seasonal temptations. Retailers falter. Everyone suffers. My solution is as simple and as elegant as a moron in a ballgown. 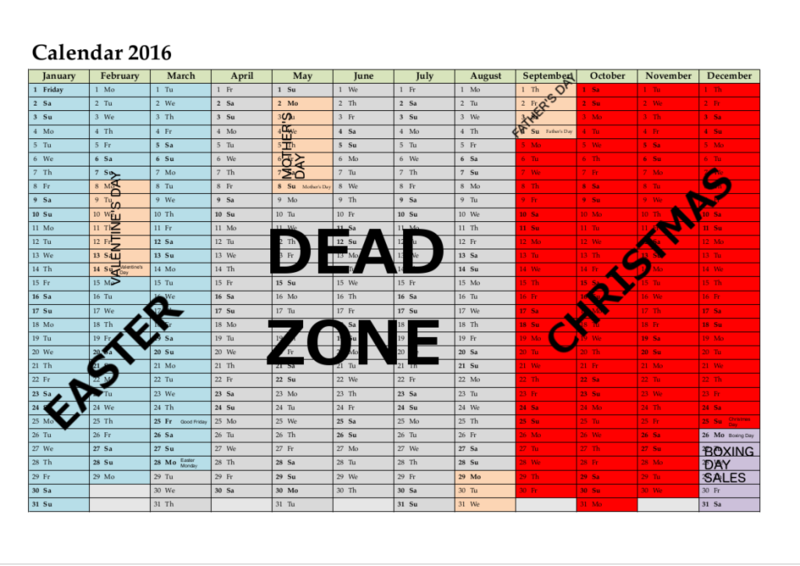 We can easily eliminate this ‘Dead Zone’: all we need do is consumerise another religious feast day. This may sound difficult, but I am certain it is achievable. In fact, I have already formulated appropriate consumerist traditions for an existing feast day and am deeply persuaded of their excellence. The feast (as you may by now have guessed) is King Saint Stephen’s Day. 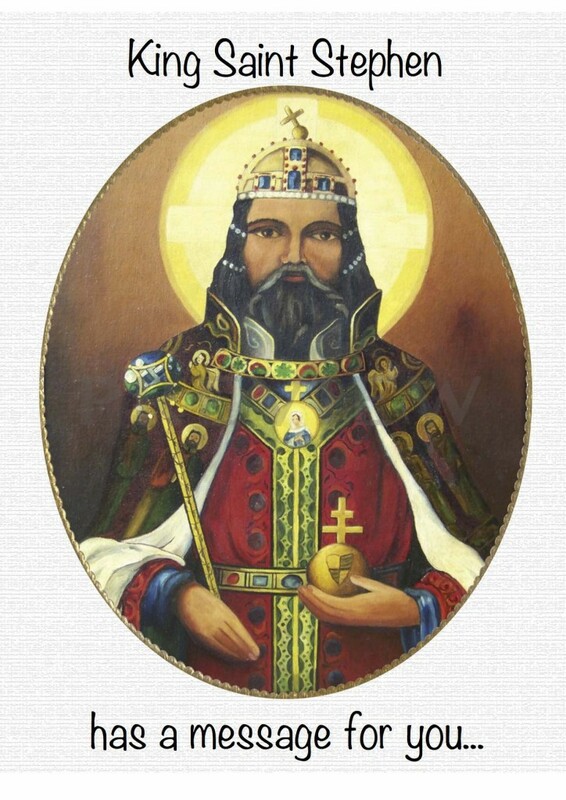 King Saint Stephen (c.975-1038, canonised 1083) was the last Grand Prince of the Hungarians and the first King of Hungary. 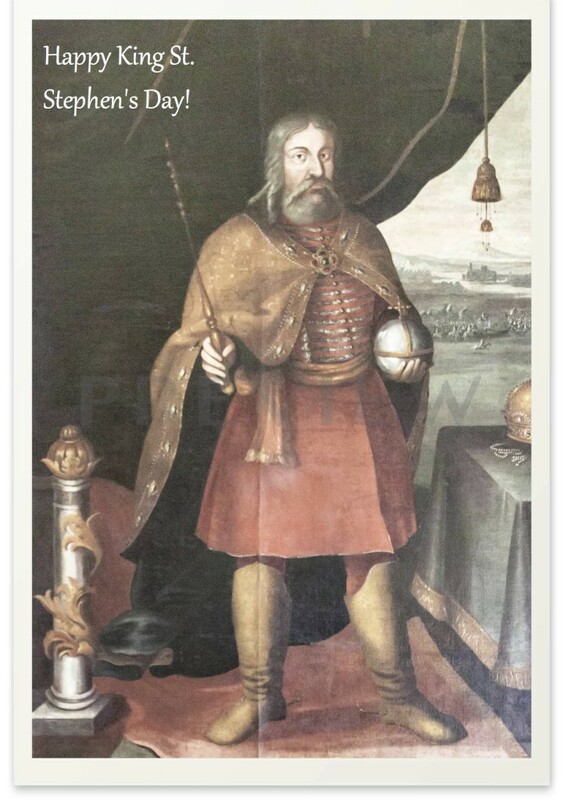 “What has a centuries-dead sainted Hungarian royal to do with modern Australian consumers?” you ask. What indeed? But you will concede that the timing of the feast (16 August) is ideal for retailers and consumers alike. In the 12th century, Stephen’s intact right hand, which was reportedly exempt from putrefaction, became the subject of a cult. Our new tradition will thus require Australians to give each other ‘Holy Dexters’, life-sized human hands sculpted from marzipan and ganache and to be eaten for breakfast. Stephen was known for his extraordinary charity. In honour of this, our new tradition will require Australians to gift one another small aluminium buckets filled with prunes. Prunes, with their highly concentrated nutrition, will represent that which we most cherish or something. 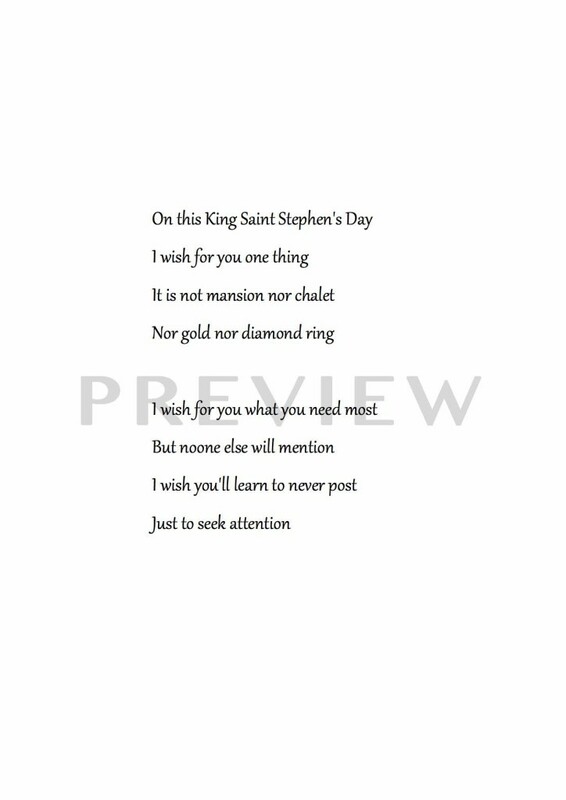 King Saint Stephen was always one for a good admonition, freely exhorting his subjects to lead better lives. Australians will therefore give one another cards (like those shown below) that voice personal criticisms. You may assume that these gifts will be made only among family, close friends or lovers, as with existing consumerist traditions. That would be to underestimate my ambition. I propose that, on King Saint Stephen’s Day, all Australians will be required to buy one small aluminium bucket of prunes, one Holy Dexter, and one card for each of their Facebook friends. This will not only strengthen the ties of Facebook friendship, but will greatly magnify the economic stimulus of King Saint Stephen’s Day. A Facebook algorithm will also allocate each Australian to a King Saint Stephen’s Day Party involving 1 to 100 people, eliminating the awkwardness that conflicting invitations may otherwise generate. I would be pleased to contact Mark Zuckerberg to make the necessary arrangements, but feel the request would have more cachet coming from all of us. I do not recommend this new tradition on a whim. 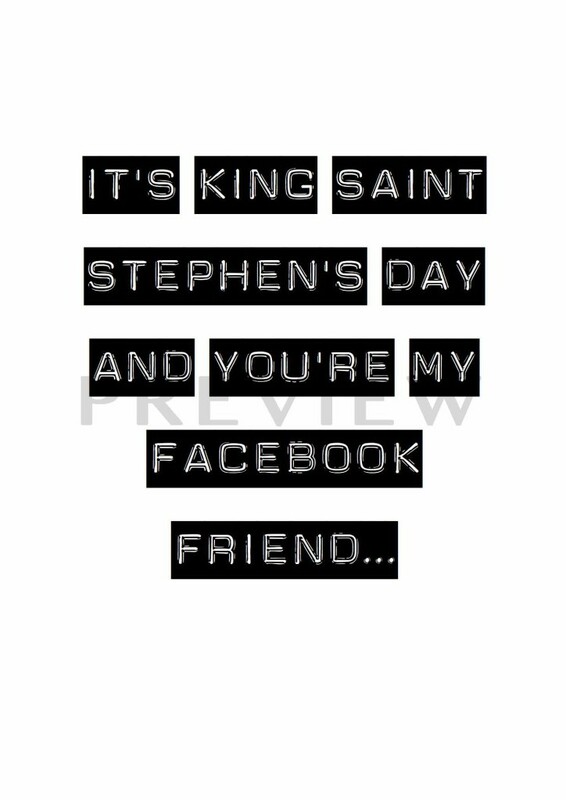 On the contrary, I have already trialled King Saint Stephen’s Day celebrations with my own Facebook friends for the last six years. Many of my Facebook friends have responded positively to their gifts of Holy Dexters and their digestive tracts are in fine fettle. There is, therefore, no cause for hesitation on your part. I am beyond certain that Australians will embrace the new consumerist celebration that we will forge together.